The Denver Gem & Mineral (Spring) Showcase is kicking off another great year with two fantastic shows — the larger Colorado Mineral & Fossil (Spring) Show held at a big hotel ballroom in Aurora on the east side of Denver, and the smaller Colorado Independent Warehouse (Spring) Show in Lakewood on the west side of town. Both shows are unique and you won’t want to miss either one. 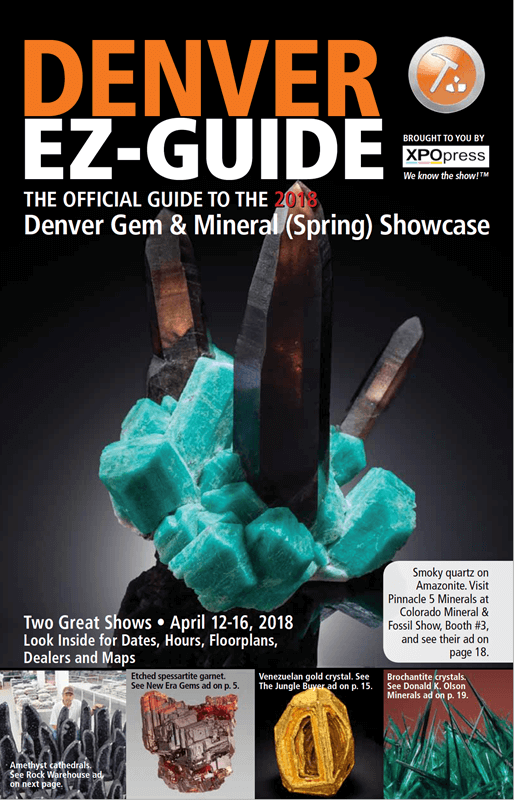 We call this Denver Gem & Mineral Showcase the “spring” showcase because a much larger and more famous Denver Gem & Mineral Showcase is held each September with eleven shows open over a ten-day period. And both of the shows that are in this Denver Spring Showcase also have shows in the Denver Showcase in September. The dates for CMFS are April 13-15, 2018, and it’s at the Crowne Plaza DIA, 15500 E. 40th Ave., in Denver. The Crowne Plaza is one of Colorado’s largest hotel/convention centers with approximately 88,000 square feet of convention/ballroom space and has over 1,000 free parking spaces. There is also 24/7 free shuttle service to and from Denver International Airport (DIA). The gem, mineral, meteorite, jewelry, and fossil communities have embraced the new venue as their new home for many years to come. The spring show in April features approximately 80 retail/wholesale dealers from around the globe. Many collectors, rock shop owners, and jewelry designers love to shop this show because of the quality of the dealers and their wonderful products and, at the same time, they can enjoy spring time in the Colorado Rockies. The spring show will also feature an array of activities from free gold panning lessons for all ages, facilitated by the Foothills Prospector’s Gold Club. In addition, there will be a free rock dig and a $5.00 dinosaur dig for the kids. Also, this year by popular demand we will be offering wire wrapping workshop classes for beginners and advanced hobbyists. Classes will be taught by Susan Gardner, owner of Perfectly Twisted. Adding to all the fun events there will be a fundraiser on Saturday evening April 14, 2018, at 6PM. The fundraiser will benefit the Colorado School of Mines Geology Museum. This event is sponsored by Rocky Mountain Gems and Minerals, The Friends of the Colorado School of Mines Geology Museum, The Rock Warehouse, Denver Rock Boxes, Inc., Xpo Press, Inc., and all the generous mineral dealers from the show who have donated mineral and fossil specimens for the verbal and silent auction. Please join us for a great meal, lots of fun, and a bidding war. Hope to see you all there! For more information log on to www.coloradomineralandfossilshows.com. Since 1989, Steve and Janet Applebaum of The Rock Warehouse, owners of CIWS, have been dealers at the September Denver Gem & Mineral Show under their old name, Desert Gems. In 2006, they moved to their own warehouse at 810 Quail St., in Lakewood, and began promoting and operating their own shows in both September and April. Both shows carry a large inventory and have eliminated soaring show fees. They stock many items that buyers won't often find at the larger shows. Making their inventory even larger and more unique, Rock Warehouse has been joined by a new warehouse neighbor, Vicjon Enterprises, the well-known Peruvian import company, and they’re open year-round. Two years ago, JK Stone joined the “warehouse team,” adding an even larger selection than before, and Carl Scott's South Dakota Rose Quartz is another dealer who displays at the warehouse shows. CIWS features a huge selection of amethyst — large decorator pieces down to crystals — from Brazil and Uruguay. Other featured minerals and products include: citrine, quartz and agate products, a wide variety of tumbled stones, gemstone carvings, Palo Santo, polished spheres, wands, points, hearts and eggs; Peruvian carved birds and framed butterfly arrangements, pyrite, and meteorites; pyrite dollars, kyanite and a large mineral selection including thumbnails, and rough rose quartz; top quality fluorite and many polished shapes and carvings, polished petrified wood bookends and other products from Cota Lapidary. The warehouse team can ship pallet purchases from the warehouse.